"Extra, extra, read all about it, the 'Morning Star' is the paper, a dime for the news." The boy in tattered clothing yells as he holds up the headline. It's 1959 and Jimmy's in New York's Times Square. The events are inspired by the song Jimmy Brown the Newsboy, by Mac Wiseman. It incorporates four chapters, the fourth being a script as the continuing story. Jimmy grew up in the Bronx as the son of poor Irish immigrants who left Ireland to pursue the American dream. They eked out a living, and while Jimmy sold the morning paper and delivered the afternoon edition, he realized that he had nothing in this world to lose, except his mum. The story runs the gamut of human emotions from the moment Jimmy's dad met his wife-to-be. It'd been a typical Irish day, a fine mist had showered the land, then the sun had come out with its rays of golden yellow. With water ascending their roots, the warm glow of the solar orb stirred the greenery to grow upwards as it bathed the earth's surface with its life giving force. All was green and alive as he walked along the meandering gravel road which led him home--he was tipsy as usual. But as he crested the rolling hill near his parent's farm, he thought he could see a young lass holding up the fence. To his great amazement, she was seemingly standing under the end of a rainbow; thus, rendering her aglow in its hues. He thought of her as his pot of gold. He thought that it was truly the top of the morning. The sun had facetted the mist into the most beautiful rainbow he'd ever seen. From the moment he'd seen her, she seemed to be wearing the rainbow as if it were a celestial mane--she was more than a pot of gold. She looked beautiful and stunning and, although the rainbow had dissipated, her glow had remained. He'd wish for a melding of the hearts. She knew he spoke from the heart, and as her eyes gazed down for a second, she noticed a four-leaf clover. She picked it up, then walked with it in hand and offered it to him. 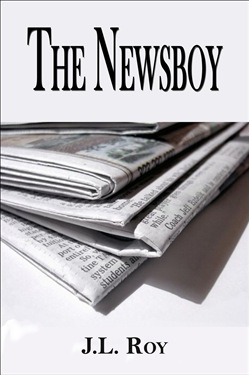 Acquista The Newsboy in Epub: dopo aver letto l’ebook The Newsboy di Jean Luc Roy ti invitiamo a lasciarci una Recensione qui sotto: sarà utile agli utenti che non abbiano ancora letto questo libro e che vogliano avere delle opinioni altrui. L’opinione su di un libro è molto soggettiva e per questo leggere eventuali recensioni negative non ci dovrà frenare dall’acquisto, anzi dovrà spingerci ad acquistare il libro in fretta per poter dire la nostra ed eventualmente smentire quanto commentato da altri, contribuendo ad arricchire più possibile i commenti e dare sempre più spunti di confronto al pubblico online.